In this section, you are going to learn how recipes can be displayed on a field basis. Basically, an NS Recipe item is made of: a title, one or more categories, a description, ingredients and directions. 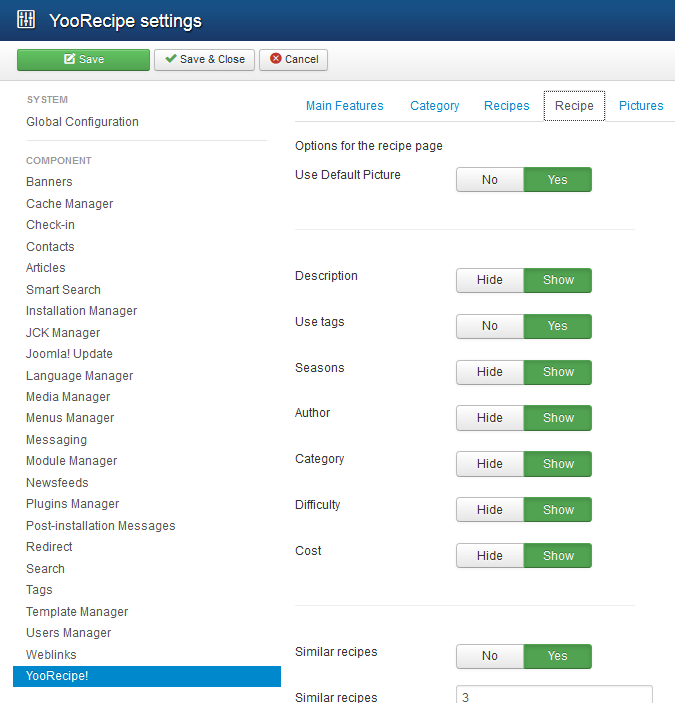 The recipe data model has constantly been enriched to match the maximum number of usages. Many NS Recipe Menu items display recipes as a blog. Menu items that fall into this category: View by Categories, Most read recipes, Favorite recipes, Archive view, Most popular (best rated) recipes, View by tags, Featured recipes, My Cookbook, Search results, View by Season, View by Chef, View all Recipes. One of the most important settings of this options tab is: Use recipe settings. 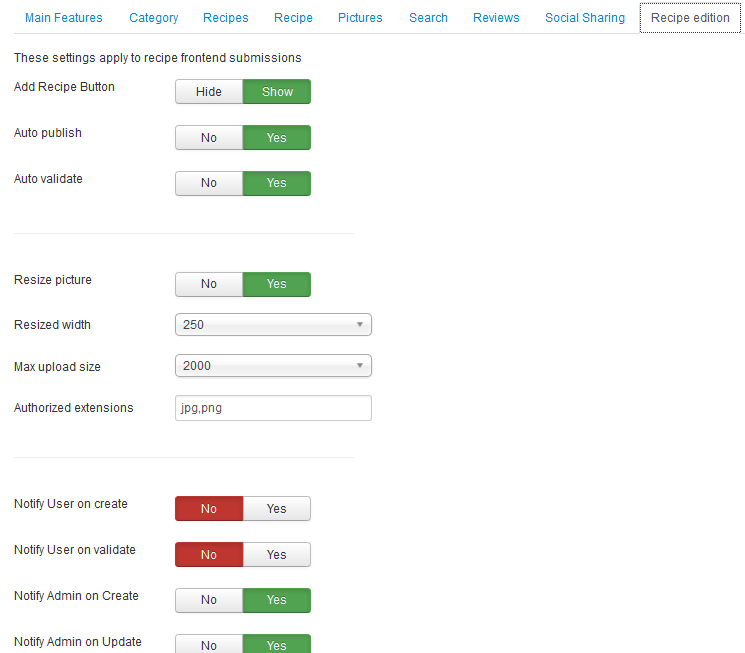 Then fields displayed in recipe submission form are those defined in Recipe tabs. Then fields displayed in recipe submission form are those defined in Recipe Edition tabs. Info This feature makes it possible to display fields in the recipe submission page that are different from those of the recipe page. 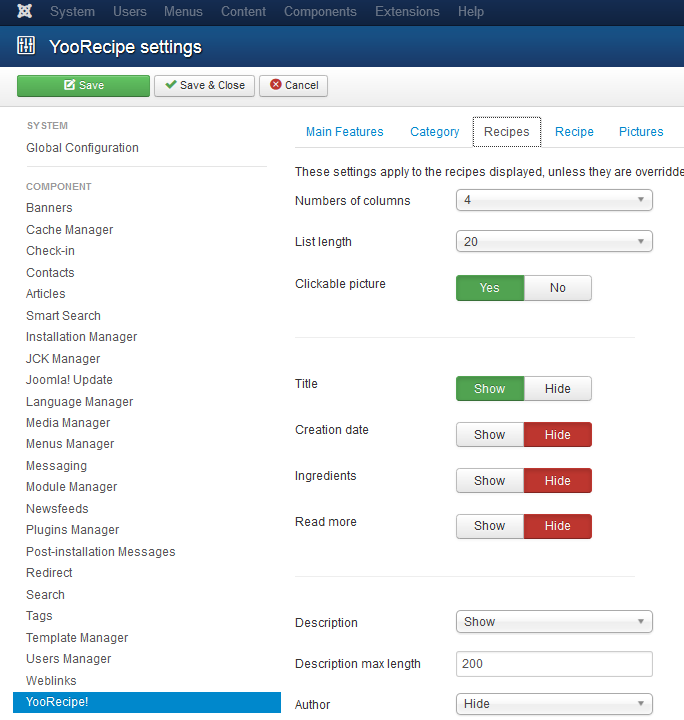 Noteworthy When editing recipes from front-end as a "Superadmin," additional fields are automatically displayed: recipe views counter, published & validated status, featured, and language.